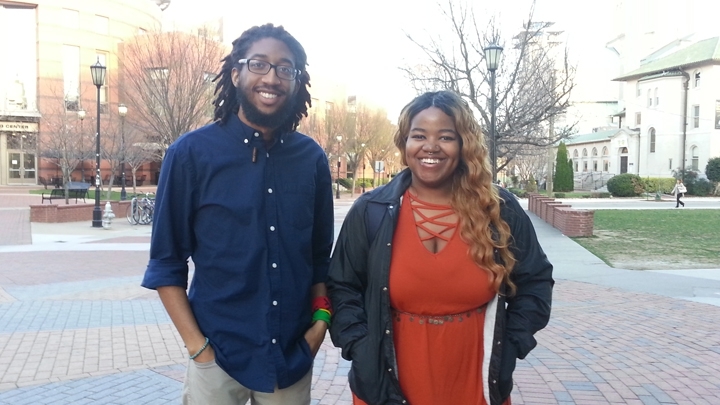 VCU grad Kendell Bazemore and Gender Studies major Brittney Maddox, two of the organizers of the Black Minds Matter project. Experiencing racism and discrimination can have an impact on mental health. But a group of VCU students say not enough people are talking about this issue. So they created a new initiative: “Black Minds Matter.” WCVE’s Catherine Komp has more for Virginia Currents. Learn More: Black Minds Matter events take place March 20-22. See a schedule and follow the initiative on Facebook. Find information on VCU’s Office of Multicultural Student Affairs. Read University of Utah Professors William Smith’s and Jeremy Franklin’s research on microagressions and racial battle fatigue. Twenty-four year old VCU student Brittney Maddox started thinking about mental health issues last year. Brittney Maddox: It actually happened after a big uprising, I don’t know if it was Alton Sterling or Philando Castille last summer. The high profile police killings happened July 5th and 6th. One was in Louisiana, the other in Minnesota. When the details emerged, some on Facebook live, people all over the country shared anger, frustration and fear on social media. Maddox: I was tired and I would log onto Facebook or Twitter and Instagram and everybody’s going haywire. Yolanda Avent: Microaggressions are those daily indignities or slights that people receive that could be derogatory, they could not be derogatory, but they take away from a person’s identity. Yolanda Avent is Director of VCU’s Office of Multicultural Student Affairs. Avent: One of my favorite microaggressions that I get all the time, sometimes when I’m speaking and people say to me, you’re so articulate and I think they’re well meaning in their mind, intent versus impact, is that they think that it’s a compliment. But the message behind it is my expectations were so low for you probably anyway or my expectations were that you were going to speak a certain way. So all microaggressions have a message. VCU grad Kendall Bazemore has also experienced microaggressions, like having his knowledge and insights questioned. He also had a class where he was the only black student. If something about race came up, students expected he’d weigh in. Bazemore: Everyone’s looking to me to give some kind of speech or some kind of story and I’m just like, “I haven’t experienced this,” and why is everyone to talk about this experience that’s so far removed from me. Professors have given international students nicknames rather than learning to pronounce their real names. Mixed race students from the United States have been asked “Where they’re from?” Navigating these microaggressions can be taxing. Avent likes them to mosquito bites. Avent: I may get a mosquito bite early in the morning and maybe I’m like I can deal with that. But by the end of the day, if my body is covered in mosquito bites, not only how I may react to you if you’ve given me my last mosquito bite of the day might be different, but also how has it now impacted me? What do I need to do from a self-care perspective? Do I need to get medicine to help? Do I need to talk to someone about my mosquito bites? Those are all the same things with which people of color deal with everyday. And it’s not just people of color, because people of color have intersecting identities so you may be a queer person of color who is a Muslim. So you’re going to get all those microaggressions from all your different identities because you’re a person of a marginalized group and your intersecting identities are marginalized as well. Maddox: Basically it’s stressors that people of color or non white people experience just existing. University of Utah professor William Smith coined the phrase while researching the impact of discrimination on the mental health of students and faculty. Bazemore and Maddox say they were both relieved when they learned there was a term to describe the stress they were feeling. Bazemore: I remember being in a class and it wasn’t until I had my first black professor here at VCU. When I first heard the statement, I felt a shift, like a shift in the universe or something. It was just like, okay, this has a name. This professor who’s gone through undergrad, graduate school, got their PHD, who’s experienced a lot of the same things that I have; we might have different identities sure, but we’re both black in academic spaces. But for that professor to say a name - racial battle fatigue - it definitely had an impact. Okay, this has a name, I’m not alone feeling this so how do I address it in my own. This stress can add up and have an impact on grades, work, relationships and physical health. But mental well-being isn’t openly talked about, say Bazemore and Maddox. And many people don’t seek help. So, they worked with a team of students on a solution: the Black Minds Matter project. Maddox: There’s a stigma between seeking mental health in the black community. Not only is it a conversation for black students, alum and the faculty here, it’s also for mental health professionals who are our allies, who want to help, but they just might not know where to start. Bazemore: A lot of these things are intergenerational and that idea of silently dealing with things is something that’s definitely passed on between black generations, from generation to generation. And one thing we all want to do is really say we want to heal ourselves first, so this won’t be continued to be passed on anymore, because it’s not helping us. The youth are developing Black Minds Matter as an online community and a three day summit on the campus of VCU. Workshops will tackle black masculinity and femininity; anti-blackness; shame and destigmatization. Maddox: Just talking about unspeakables so LGBTQIA issues, talking about homelessness or prison industrial complex, just issues that have shame tied it and trying to work through that and affirm people. Bazemore: As someone who is both queer and black myself, a lot of the coming out process for me was bringing these two identities to some kind of harmony. I didn’t have any visible representations of how to do that or somebody who’s living that. There’s definitely a lot of shaming involving queerness within the black community and how these things can intersect with other identities that we have as well. Other sessions look at how allies can support people of color. Maddox: Speak up, but not speak over, which is a big one. Bazemore: I always appreciate and want to see more of, is being more active in calling out anti-black or racist things in general, regardless of it’s black people or not, calling things out that you know are not correct. The students work builds on efforts by the Office of Multicultural Student Affairs. They hold regular workshops and activities connected to identity, health and well-being of marginalized groups. Avent: It’s something everyone should take responsibility and onus for and educate themselves about. The education should be universal around these things and not the burden of people of color or LGTBQ or people of various religions, it’s something everyone universally should be educating themselves about. Bazemore: So often people let things fester and seethe inside, that does make you sour especially when you see other people who are happy around you and you’re the one feeling in such a funk. There is something to getting it out of you system, whatever vehicle that might take, I think it’s always a good thing. The Black Minds Matter Summit takes place March 20th to the 22nd. Students hope this gathering is just the beginning, and they’ll be able to continue and expand this initiative. For Virginia Currents, I’m Catherine Komp, WCVE News.